If you are not sure if University is right for you at the moment, whether you are a new or continuing student, enrolling or re-enrolling may not be the best thing to do. Enrolling on a course can have implications in other areas such as student funding (both current and in the future), council Tax, tenancy agreements and welfare benefits. 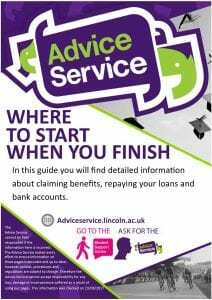 If you have any doubts you can get professional, confidential advice from the Advice Team at the University of Lincoln. Student Finance England have rules around how many years you can receive student loans. As a rule, they will fund you for the duration of your course plus one year minus any previous study. When you enrol on a course Student Finance England will consider this to be one year’s previous study even if you withdraw on the same day. If you have compelling personal reasons for needing to repeat a year, Student Finance England can take these into consideration on a case by case basis. The Advice Team at the University of Lincoln can talk to you in confidence about any of these issues. If you have not yet enrolled and you are uncertain about what to do we can help. If you withdraw from your full time course and are no longer studying full time, you may be liable for council tax because you are no longer meet the requirements for Council Tax exemption. If you are not working or on a low income and you find yourself liable for council tax you may be able to claim Council Tax reduction. When you sign a tenancy agreement it is a legally binding document and it is not usually possible to ‘get out of it’. You can find more information about housing issues by looking at our housing page. You can find further information about renting by following the links below. 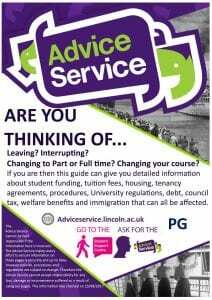 The Advice Team can advise you about all your options if you are thinking of leaving your accommodation. Sometimes, through no fault of your own, you may find that by leaving University you have incurred some debts. The Advice Service is licensed by the Financial Conduct Authority to provide specialist debt advice confidentially about how you can address this situation. If you are no longer a student you can get free confidential advice about how to manage the situation form a number of agencies, below are a few links to help you find a local free advice agency near where you live. For students who leave university they can sometimes find themselves tied to a tenancy agreement because they have signed a fixed term contract and are bound to pay the rent for the duration of the contract even though they are not living there anymore. If you are no longer a student you can get confidential advice about how to manage this situation from a number of agencies. Whether you are interrupting/suspending or withdrawing from University this may change your entitlements to welfare benefits. Please take a look at the benefit section.